Joe Sanes, left, became an honorary boot camp graduate June 14 when Capt. John Dye (right), commanding officer of Recruit Training Command, presented Sanes with his graduation certificate. Joe Sanes served his country during wartime for six years and survived a torpedo sinking his ship — all before he graduated boot camp. Sanes, a World War II veteran, officially graduated from boot camp on June 14, more than 70 years after he enlisted in the Navy, a Navy release said. The young sailor had only been in boot camp for four weeks in 1941 when Pearl Harbor was bombed; he was immediately assigned to the destroyer Hammann, never graduating. During the pass-in-review ceremony, he was presented with an honorary graduation certificate from Recruit Training Command. His wife of 65-years, Libby, was in the audience. “The 700 other recruits that graduated, they became my shipmates even though I was old enough to be their grandfather,” Sanes said via phone from his home in Wilmette, Ill.
During his time on the Hammann, the destroyer was struck by a torpedo from a Japanese submarine during the Battle of Midway and sank in less than four minutes, killing 79 enlisted crew members and 10 officers. “I was lucky. The survivors are not the heroes. The real heroes are the ones who never came back,” he said. Sanes was discharged on Nov. 14, 1947, as a machinist’s mate second class. He participates in speaking engagements around the country to educate the public about Navy history and to honor his shipmates. Honorary??? This man did more in the Navy than most of us who DID finish our training! He saw more action than we did during “service week” and deserves more than “HONORARY”. Remember, we were at war and even Academy grads were “excellerated”. Does that make them “honorary”? NO!!! MM2 Sanes, I salute you! What you did with only 4 weeks shows what the Navy trains young men to do. God bless you! 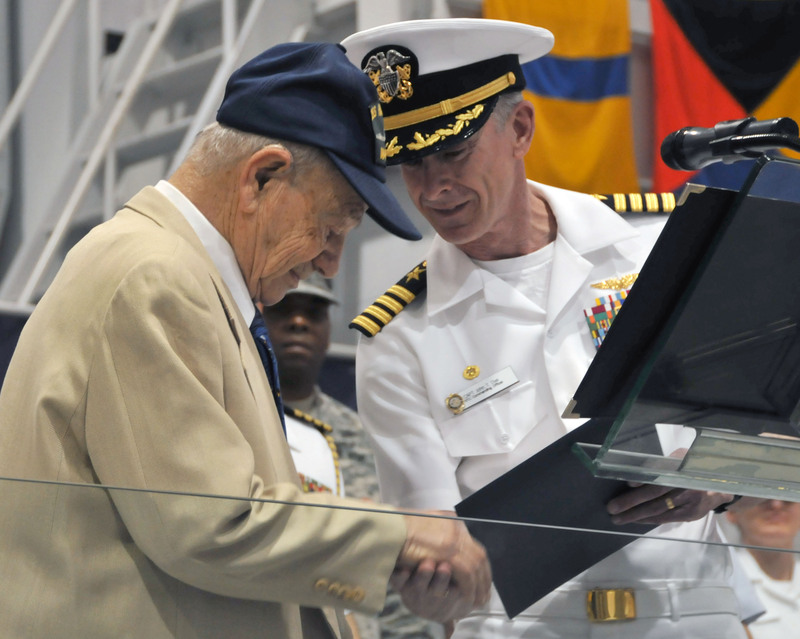 I wish I could have been there to see this humble WWII Sailor receive his certificate. What an incredible man! It makes me very proud to be a United States Sailor!